BUREAU OF ENTOMOLOGY-BULLETIN No. 95, Part VI. L. 0. HOWARD. Eantmmoloit and Chief of Bureau. PAPERS ON CEREAL A-ND FORAGE INSECTS. Agent and Expert, Cereal and Forage Insect Investigations. i .i ii: C .
R S . :iii::: ":E.
B UREA U OF ENTO MOLOG Y.
C. L. MARLATT, Entomologist and Acting Chief in Absence of Chief. R. S. CLIFTON, Executive Assistant. W. F. TASTET, Chief Clerk. F. H. CHITTENDEN, in charge of-truck crop and stored product insect investigations. A. D. HOPKINS, in charge of forest insect investigations. W. D. HUNTER, in. charge of southern field crop insect investigations. F. M. WEBSTER, in charge of cereal and forage inject investigations. A. L. QUAINTANCE, in charge of deciduous fruit insect investigations. D. M. ROGERS, in charge of preventing spread of moths, field work. ROLLA P. CURRIE, in charge of editorial work. CEREAL AND FORAGE INSECT INVESTIGATIONS. F. M. WEBSTER, in charge. SON, VERNON KING, entomological assistants. NETTIE S. KLOPFER, ELLEN DASHIELL, preparators. during the season of 1911----------...- ...................... 100 .
during theseason of 1910.. -------------------------------------96.
given date in 1910 ............................................... 100 :? U. S. D. A., B. E. Bul. 95, Part VL. PAPERS ON CEREAL AND FORAGE INSECTS. and pupated. Adults emerged September 2 and September 15. Grove, Fla., on May 9, 1887, and sent to the Bureau of Entomology. received on June 1, three more moths emerged on the 24th. from the seed pod of Crotolara sagittalis. I Bureau of Entomology Notes, No. 3819. 2 Bureau of Entomology Notes, No. 4129.
a Bureau of Entomology Notes, No. 7044. 4 Bureau of Entomology Notes, No. 7173. 6 Bul. 82, Pt. III, Bur. Ent., U. S. Dept. Agr., p. 25, 1909. C. F. I. I., May 31. 19122.
of the variety were collected west of or in the Rocky Mountains. closely resemble the European specimens of E. zinckenella. to lima beans and they were recently found by Mr. H. 0. Marsh..
of this bureau, working on the same crop in that State. Mr. E.
I Die Schmetterlinge von Europa, von Friedrich Treitachke, 9 Band, p. 201, 1812. SHorme Societatia Entomologice RoSic, voL 16, p. 177,1881. 4 Bureau of Entomology Notes, No. 48 K.
this genus (Crotolaria incana) at Cocoanut Grove . Fla. Mr. C. L. Marlatt3 records finding the *^krtv' o: . field peas at Pullman, Wash.
colorless, and with fine irregular corrugations on the surface. Full-grown larva from 12 to 17 mm. in length and from 2.5 to 3.5 mm. in diameter. 1 Bureau of Entomology Notes, No. 7173. 3 Bureau of Entomology Notes, No. 7044. 4 Syst. Bearb. der Schmett. von Europa, vol. 4, p. 72, 1849.
and head brownish yellow. Five pairs of prolegs situated on segments 3, 4, 5, . Hlof dots; both pairs converging anteriorly, the anterior"
Greatly enlarged. (Original.) brown. Fourth, filth, and sixth abdominal segmentt. scales being longer than usual. line. Beneath even glistening, very light fuscous." (Hulst, Trans. Amer. En. peas; these were brought into the insectaxy but failed to hatch. body does not assume the rosy tint as described until nearly mature. it spins a tough silken cocoon in the nearest available sheltered place. been obtained in our laboratory on August 5 and as late as August 28.
emerging at the time the earliest lupines are setting seed. On the lupines there are very probably two generations a year. .~ ~~ . .: .... :::::::. Mr. Theodore Pergande3 received a number of larvae from Mr.:! larvae. In such pods the seeds were always more or less destroyedi!. The pods also contained a mass of frass which was held together by a:i'! loosely constructed web. A few days later, on examining the cola. holes in the sides and two larvae were found with half their bodies"
rowed 2 or 3 inches below the surface to pupate. On August 1, 1910, Mr. M. W. Evans, of the Bureau of P1..
Industry, told the author of a larva that he was finding in the fiel-. L Bureau of Entomology Notes, No. 7044.
a Bureau of Entomology Notes, No. 4129. SBul. 82, Pt. III, Bur. Ent., U. S. Dept. Agr., p. 25, 190.
previous year, differing only in being larger, measuring about 17 mm. out doubt, to the difference in food plant. on the same day two moths emerged from the earth in 'the flowerpot. EXPERIMENTAL WORK CARRIED ON DURING TIHE SEASON OF 1910.
bility of the various varieties under semiarid conditions. Mr. M. W.
harvested from each plat was kept in individual packages. exit hole, while the former gnaws into the seed very irregularly. that the attacks of the pod moth were not restricted to any onen"
of the field, but were more or less promiscuously distributed. " south, thus giving a northerly exposure. The vacant rectangle ! the center of the plan indicates a wheat-straw stack. --- --- -- ----- -1 --- ----- --- -- ----. ______ --.________ ^^i ! other by strips of oats 1 yard in width. " the individuals of a variety being quite- uniform in response to give"
conditions. This fact at once opened the question of a worm! 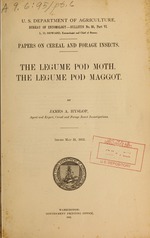 TABLE I.-Record of experimental work on the legume pod moth for the season of 1910.
o. ing. bloom ended, of seed. damaged, damaged. PAPERS'ON CEREAL AND FORAGE INSECTS. decidedly the most severely attacked. bloom on a given date in the season of 1910. EXPERIMENTAL WORK CARRIED ON DURING THE SEASON OF 1911. .? .. .. . .
of pas n ful boom n agive dae in191. (Oigial. of one variety was destroyed. However, the results obtain! conclusive as those recorded last year. .
done to all plats which came into full bloom on any one dat e.
4* ." . ... ..
% " " .. .... . ., 'i":"
. .., '. j-.' an .'" 102 PAPERS ON CEREAL AND FORAGE INSECTS. .
12 ..... ... ... ... ..
4 .. .. .... .. .. ... ..
bloom on a given date in the season of 1911.
by being shipped with the seed field peas. Etiella zizjckenella schisticolor during the investigations at Pullma|. Santa Ana, Cal., and Mr. C. L. Marlatt2 records rearing a braconaii. from the larva of this moth at Nuecestown, Tex., on May 13, 1896. .
REMEDIAL AND PREVENTIVE MEASURES.... "
and for this reason there have beehfi o'" "ti"riments with remedies. The transportation of the hibernating forms in sacks of seed, and the.:'.! tion of the seed with carbon bisulphid. 2 Bureau of Entomology Notes, No. 7044. i.
greatly facilitated the emergence of these flies. radishes at San Francisco, Cal. 1 Bul. 66, Pt. VII, Bur. Ent., U. S. Dept. Agr., p. 95,1909.
thoracic segment a pair of fan-shaped thoracic spiracles which are . Puparium ferruginous, dark brown at ends. finely wrinkled. Hook jaws of larva visible. White, head large, front protruding. Legs and wing pads free. Third pair of legs under wing pads except tarsi. mologische Zeitschrift, volume 42, page 234,. 1897. FIG. 44.-Thelegume pod maggot: Adultinale, enlarged; side of head of female, much enlarged. (Original). 108 PAPERS ON CEREAL AND FORAGE INSECTS..
hyaline, longitudinal veins 3 and 4 parallel, anterior cross-vein pe. (Iolaspis n. sp.) belongs to a genus of which there are twai. species, Ilolaspis parellina Boh. and H. papaveris Thorns., recor&..
parasitic on Cecidomyia spp. The other parasite (not yet detai"